Okay, that is a little embellished, but I was ready to sign my life away to experience a ‘must-do’ in Sydney–the BridgeClimb. With rates starting at a whopping $220 Australian dollars, it’s a little, er, steep. But I had heard it was worth it and doubted I’d be climbing many more bridges in my life. The Sydney Harbour Bridge was built in 1932 and is the world’s largest (but not the longest) steel arch bridge with the top of the bridge standing 134 meters above the harbour. Fondly known by the locals as the ‘Coathanger’, the Sydney Harbour Bridge recently celebrated its 75th birthday. When the Bridge opened, it cost a horse and rider three pence and a car six pence to cross. Now horse and riders cannot cross, but you can bicycle or walk across the bridge for free. Cars cost anywhere from $2.50-4.00 for a southbound trip and it is free to go northbound. In 1932, the average annual daily traffic was around 11,000 and now it is around 165,000 vehicles per day. The whole climb operation ran like a well-oiled machine. One of the first things they actually do is a breathalyzer test! Alcohol readings over 0.05 will exclude you from the climb. Yeah, I’m thinking you do not want to be stumbling onto the top of a 450-foot high bridge. I’m assuming one of the reasons the climb is so expensive is they must have a huge liability insurance policy, so having tipsy climbers probably isn’t in their (or your) best interest. The climbing crew herded twelve of us from room to room gathering our specially-made, bridge climbing suits, harnesses, headphones and radios, and clipping on various accessories like rain shells, handkerchiefs, and fleeces (in case it got cold or windy at the 900-foot summit). After a small demo of what we needed to do on the bridge we were on our way. The whole experience lasted about three hours. It was a surprisingly gentle walk up the curved arch of the bridge, and perfectly safe, as long as you aren’t drunk, of course, and don’t have a problem with heights… because it is high. We went up several ladders and then ascended the eastern arch of the bridge. And then we were literally walking on the top of the bridge. Most of the areas we scampered across were formerly only accessible to bridge workers. Halfway into the tour it started to rain (of course!) and as we donned our special “bridge climb” rain gear, we reached the ‘summit.’ This was pretty cool. We had amazing 360-degree views, in between raindrops, of the harbour and stunning Sydney skyline. Looking down, you could see the rush hour commuters whizzing by to get home after a long day’s work. Every few minutes the bridge would rumble with the sound of the commuter train that also crossed the bridge. We snapped some photos, crossed over the top of the bridge and began our decent down the western arch. Again, when I say descent, we were literally just walking down steps, so it was not like we were scaling the bridge or repelling down its side–this was all very tame, but cool just the same. 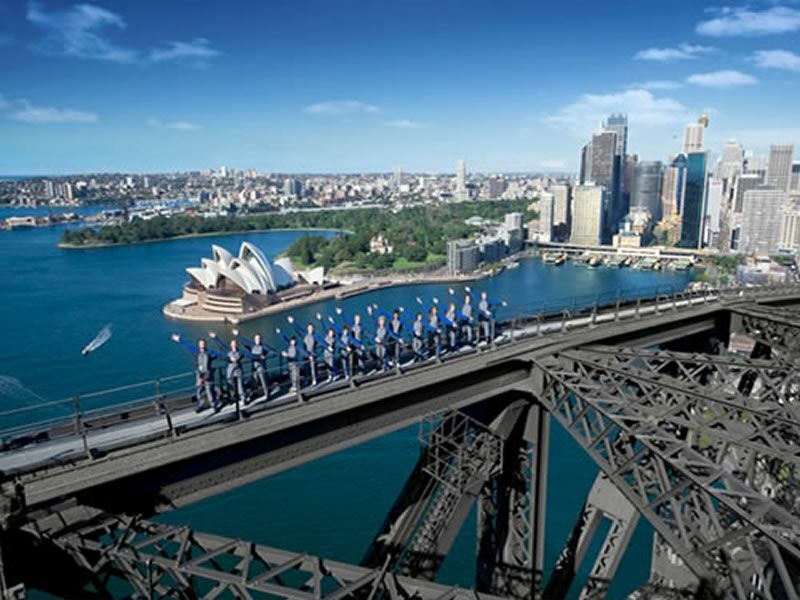 BridgeClimb celebrated its 10th anniversary in 2008 and is investigating the possibilities of other ‘bridge climbs’ around the world. Negotiations are currently underway for a similar operation on the Brooklyn Bridge in New York City.